There are these rare, very rare moments when you find yourself sitting at a local festival that couldn’t be further away from anything steampunk or dieselpunk if it tried and you realizes that the band that just started to perform on stage is, in fact… a steampunk band. Imagine my surprise, nay shock, when I found a steampunk ensemble from Spain on stage, who may or may not had a Belgian beer too many. Pan de Capazo was an excellent band and reminded me a little of The Steampunk Stompers. Even faced with a crowd that, while appreciating their music, knew absolutely nothing about steampunk, they stuck to their backstory of mad scientists in a hot air balloon. Which I could really appreciate, as much as their eclectic sound. 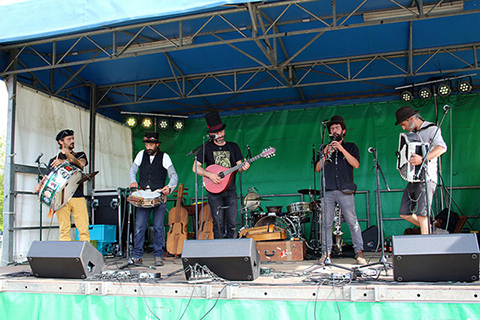 The sheep-shearing festival may not have been the best place for Pan de Capazo, but they rocked the stage all the same with their own brand of steampunk folk. Should I have the opportunity to see them live again, I would definitely go for it.